IN THE END of 2011 several appointments took place between the Project Manager of SCECH, Lars Gerdmar, and the Director General of ARCCH, Ato Yonas Desta at his office in their new building situated close to the National Museum in Addis Ababa. Rewarding discussions about the objectives of SCECH was held and the arguments for why we would like to to start our pilot project of conservation and education at the heritage site of Yimrihane Kristos (YK) was presented. 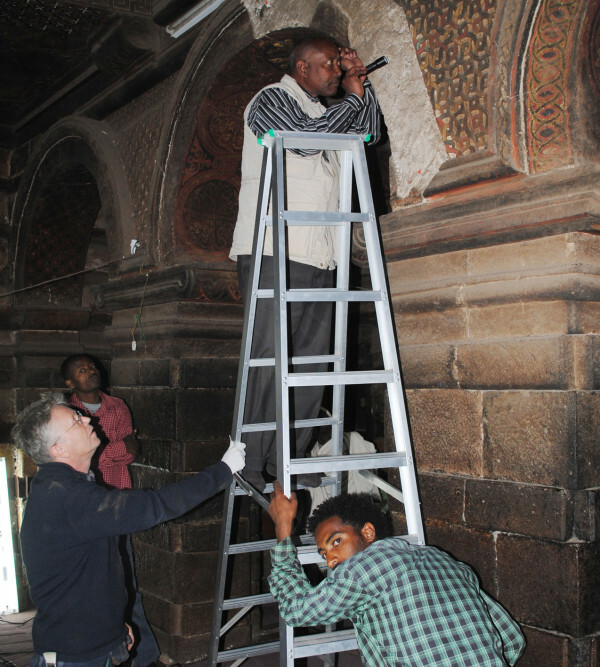 A setback for our first target, the medieval church of Debre Selam Mika’el, situated at the Atsbi platau in Tigray, shortly before, due to a sudden resistance from the locals, did partly color these meetings. A five days preliminary examination had the year before taken place at this site and as everything was well prepared and the locals here had been very positive to us and a conservation, this setback was a big surprise. Ato Yonas deeply regretted this and apologized on the behalf of Ethiopia. He found our project most interesting and ensured that he and ARCCH would welcome a restart at YK. The matter of fund raising, which for a project of this kind and extension demand a large sum of money, was of course also part of the discussions. SCECH could just ensure that we would make our outmost in order to arrange with this. However, this should later on show up to be more difficult than expected. 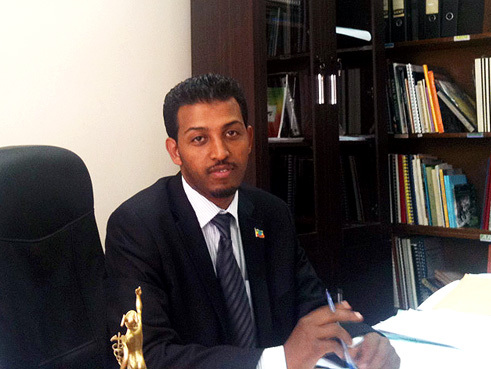 Ethiopia is still a developing country and funds and countries in the rich world make priority to the battle against poverty and do not easily understand what the interaction between responsible tourism and heritage management in the long run also could mean for the local and national economy. However, engaged in a pioneering work as our project you just have to cope with these a bit insecure premisses and after handling in our application during following spring, ARCCH soon afterwards gave the permission to make our examination in order to start the pilot project of conservation and education in YK. Find below the application and permission documents for the examination in October 2012, which made the first step of our project. 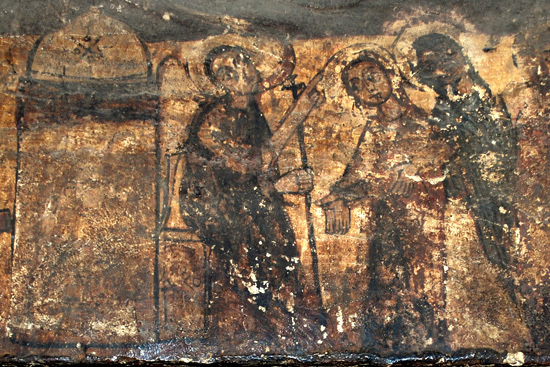 The Ethiopian churches from the 6th to the 19th century accommodate works of art, which are unique and priceless, a religious and cultural heritage, which, if nothing is done, will be ruined. Magnificent paintings on walls and in ceilings, executed in al secco on plaster and in tempera on canvas glued to wall, are often in bad shape and in acute need of restoration. 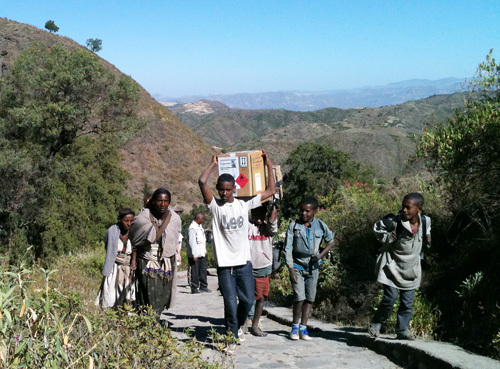 In Ethiopia, the professional knowledge and financial means needed to take charge of this are largely missing. Our ambition is to carry out a pilot project in one of these endangered churches and here preserve the murals and ornamental painting in need of conservation. This presupposes that technical investigations are done, working instructions are established and permissions from relevant cultural and ecclesiastical institutions in the country are granted. As an answer to the need of a domestic education an important part of the project will be devoted to apprentice education, i.e. trainees are invited to receive basic training in painting conservation on location. This will in turn create a basis for further education. 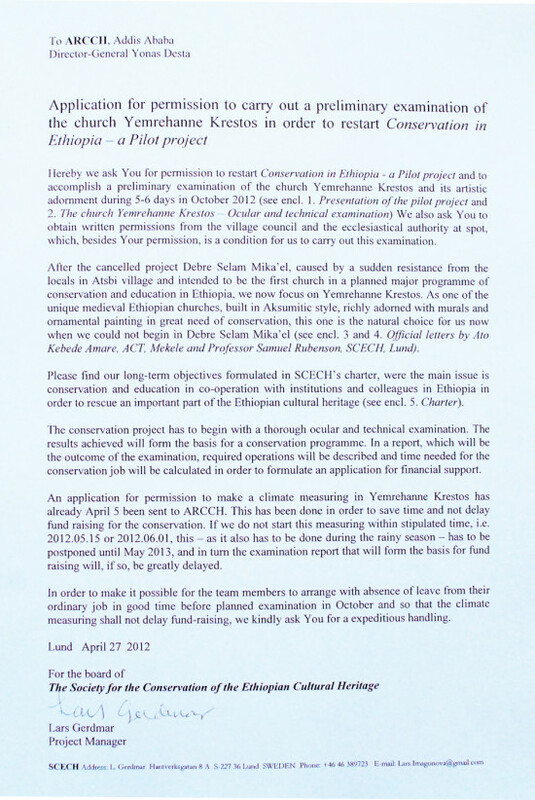 As the local establishing is of outmost importance recruitment of staff, besides the trainees, will, as far as possible, be made in Ethiopia and simpler task as well as basic instructions of care taking will be handed over to the local cultural authorities and priests and monks themselves. This will ascertain that no further damages are done while, awaiting professional aid and establish a co-operation on location which is psychologically right and meaningful for all of us. 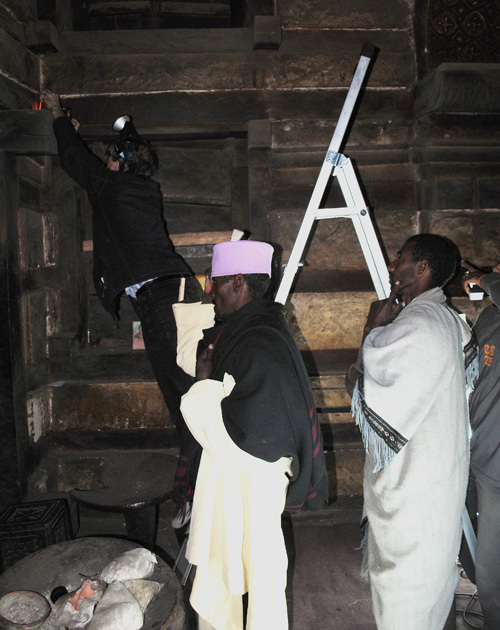 An organisation named The Society for the Conservation of the Ethiopian Cultural Heritage (SCECH) has in 2011 been established in order to support the project. The members of this society represents professions on highest level as well as scientific and cultural institutions with extensive educational potential of great value at the implementation of the pilot project as such as well as at the planning of the enlarged project towards which this one is aiming (for further information about SCECH, see encl. 5. Charter). As a way of making the project as well as this part of the Ethiopian artistically legacy in a broad sense public to the world, a documentary is planned to be done by two experienced filmmakers working for the renowned French-German broadcast channel ARTE. Our hope is that this pilot project will draw attention to the need for professional and financial aid in broader sense with a view to taking care of and protect these priceless cultural properties, not just for the Ethiopian people, but also for the entire international community. 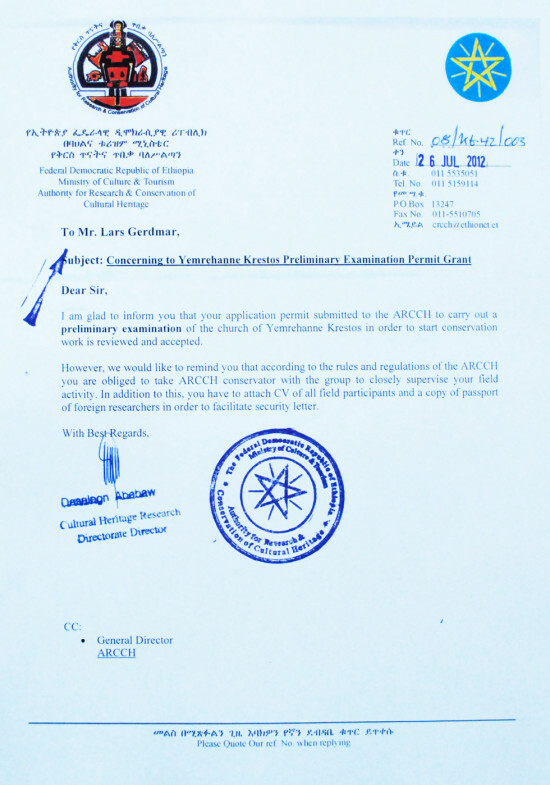 The preliminary examination will take place during 5-6 days in October 2012, after issued permissions by the Authority for Research and Conservation of Cultural Heritage (ARCCH), Addis Ababa as well as by the village council and the ecclesiastical authorities in Yemrehanne Krestos. It will be conducted by a team chosen by SCECH, specialized in the field of conservation and building construction. Responsible for the examination will be the board of SCECH and below mentioned delegated expert team, practical co-ordinated by Mr. Lars Gerdmar. The purpose of the examination is to get the necessary information for to implement a conservation and restoration of the pictorial program in the church. The results achieved will form the basis for a pilot project of conservation and a conservation program. In a report, which will be the outcome of this examination, required operations will be described and time needed for the job will be calculated in order to formulate an application for financial support. Below follows a brief presentation of the practical contents of the examination. Here all planned operations are mentioned. If all of these are necessary to implement will be taken into consideration at spot during work in progress. The restorers and the engineer will do this part of the examination. In order to receive information on the make-up of plaster, the degree of decay as well as possible salt content two, smaller pieces of plaster, 3-5 square cm, will be taken in suitable places in the church chosen during the examination. The first one is taken on a place that is damaged, the second one as reference on a place in good condition. Five to seven small samples of pigment, 2-4 square mm (micro cuttings), will be done on the murals and the same amount will be done on the decorative painting on wood in order to find out type of pigment and its binder. A small quantity of mortar, not more then a few gram, will be taken in order to find out the composite. A small piece of the stone, which belongs to the building construction, will be taken for to establish which kind of stone has been used. A small sample of possible water inside or in direct connection to the church will be taken in order to receive information on salt content and other possible contamination. Leaching of salt is done in order to determine possible content of salt in the mural paintings and to inquire whether it is possible to extract/remove salt. This is done by exposing cellulose wading compresses moistened with distilled water for possible salt in the surface of the material. The compresses are fixed on the wall for some hours and then a possible salt content in the sampling material can be measured. A few cleaning tests, in well-established techniques, will be done on places in optimal condition. This is done in order to find out how heavy the dirt layers are, how strong these are attached to the painting surface, as well as to be able to calculate time for this part of the conservation. Suitable places in the will be chosen at location during the examination. A few consolidation tests on smaller surfaces, with agents recommended by the international community of conservation, will be done in order to find out the optimal mixture of the consolidation agent (i.e. the agent which stabilize the material) and the approximate time this operation will take. The architect will conduct this part of the examination. The exterior and interior of the church will be measured by laser measuring (CAD). This will be done in order to launch the project internationally not least for financial support as well as in order to calculate the time needed for to implement the project. 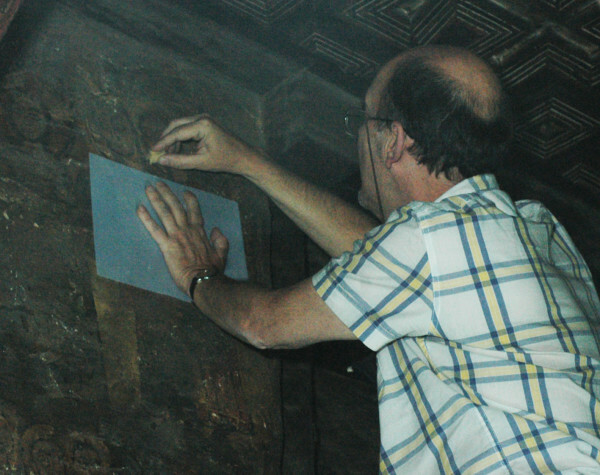 Some measures as regards separate paintings in the church will perhaps be done manual. The photographer will do most of this part of the examination. The exterior and interior of the church will be carefully documented. Some 3D photos will be taken in order to be used at the launching of the project. A few panning photos will be taken in order to present the site and its buildings. A few photos, which present work in progress, will be taken. Photos, which document damager as well as sampling and work in progress, will be taken both by the photographer and other team members. This part, hopefully done by the filmmaker Joachim Demmer, does not belong to the actual examination but will probably be done in parallelly with this one and should therefore be included in issued permission. In order to plan for a possible documentary conducted by ARTE, a renowned French-German broadcast channel, the filmmaker Joakim Demmer, Berlin, will perhaps be present during the examination in order to make some film sequences. If this filming will take place it could be a possibility to use parts of this film material in the launching of the project as well as in the application for funds.